Our key finder is super-thin and lightweight, perfect for attaching to your keys, purse, backpack and more. Now, you can easily find all your important things. Use your smartphone to make your NUT find3 ring when it¡¯s nearby, but out of sight. If your NUT find3 is within Bluetooth range, it will play a loud tune. 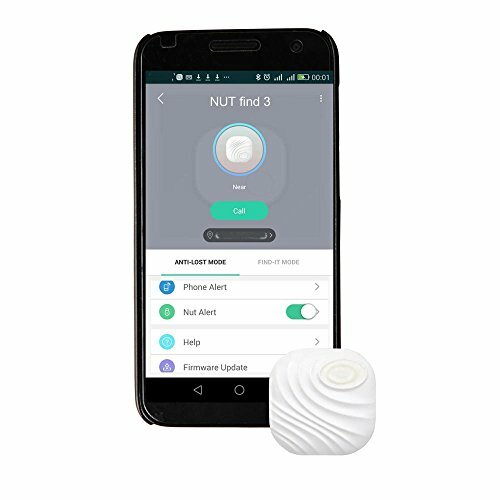 Double tap the button on your NUT find3, your phone will begin to ring even on silent,If it is within Bluetooth range. The NUT app automatically records the last time and place it saw your item. So, if you left it somewhere, you know where to look first. Find and share items with anyone,Can't find the television remote?Track and ring the key finder device from multiple phones and Nut accounts. No need to replace NUT find3 each year. Just replace battery yourself once a year. Extra battery included. If your phone is Android 4.3 or higher with Bluetooth 4.0, you can try. Attach NUT find3 to anything and use NUT Tracker App to find your Item fast. Now with an improved buzzer! Found Network&Family Sharing, Millions of people from the network helps you find items outside Bluetooth range;Find and share items with anyone,Track and ring the key finder device from multiple phones and Nut accounts. NUT Tracker app will show last known location on a map, and tell if you are near or far, press find and NUT find3 will ring. Also has a separation alarm to alert you if you left something behind. If you have any questions about this product by YOUDUO, contact us by completing and submitting the form below. If you are looking for a specif part number, please include it with your message.